Sussex Wildlife Trust has worked in partnership with the Sussex Inshore Fisheries and Conservation Authority (IFCA) to help improve the health of our marine environment off Sussex. As part of the Sussex Coastal Habitats Inshore Pilot (SCHIP1) project, we have worked with decision-makers, local experts and key stakeholders to develop a better and shared understanding of the habitats, species and pressures on the Sussex coastal water body. This stretches from Selsey in the west to Beachy Head in the east and out to 1 nautical mile. We have also looked at how the wider marine community can help gather data to assist in the assessment of the health of our marine environment. A key output of the project is the creation of a habitat map for the Sussex coastal water body, far more accurate and detailed than anything else that currently exists. Knowledge of what habitats are where is vital in directing management to where it is most needed. SCHIP1 is part of a much bigger project run by the Environment Agency called the Adur and Ouse Catchment Pilot, which has looked at ways of engaging with local organisations in the catchment in order to improve the health of its water bodies. Improving our understanding of our coastal environment, the pressures facing it, and what we can do to tackle these pressures is essential for achieving ‘good ecological status’ of our water bodies, as committed to under the Water Framework Directive (WFD). The need for more data on our marine environment has also been highlighted through the current designation of Marine Conservation Zones under the Marine and Coastal Access Act (2009). Sussex Wildlife Trust has been involved since the beginning of this process and has seen that the paucity of supporting data could result in many sites not getting the protection they desperately need. Our SCHIP1 project with Sussex IFCA will help to start to address this in our county. 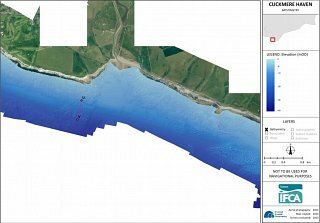 As part of the SCHIP1 project, bathymetry data (the depth to the seabed) and ground truth habitat data held by Sussex IFCA were mapped to create detailed underwater maps of the project area. Seasearch data (from trained volunteer Scuba divers) formed an essential component of the habitat data used to inform maps. 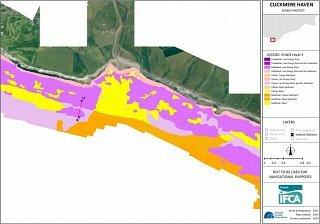 The bathymetry data covered an area of 152 square kilometres from Dungeness to Selsey Bill and out to one kilometre from the Mean Low Water mark. Unfortunately, currently there is currently a gap in the data between Newhaven and Hove. Organisations are working in partnership to ensure this is filled in soon, finances and data collection allowing. The data was then interpreted by the Channel Coastal Observatory to produce a series of maps, including bathymetry, backscatter, seabed slope, anthropogenic features, marine habitats and substrate. These are all available to the wider public, for individual use, and to help develop a better and shared understanding of the marine environment of the area. This data will also be invaluable for informing a range of marine conservation, planning policy and management objectives within the Sussex coastal water body. You can download the full report below; the data layers are publicly available at the Channel Coastal Observatory. This report, produced by Sussex Wildlife Trust, summarises the engagement aspects of the SCHIP1 project. It provides a flavour of the wider marine community’s opinions and work, and an indication of where the Environment Agency could focus their efforts with future partnership working and monitoring programmes in the Sussex coastal water body. Results of both the Twitter poll and questionnaire indicated that the majority of people are not aware of either the WFD (62% and 48% of respondents, respectively) or Catchment Pilot project (92% and 52% of respondents, respectively). Both the Twitter poll and questionnaire suggest the majority of stakeholders feel Sussex’s coastal waters are of 'ok' health (67% and 54% of respondents, respectively). In contrast, the majority of decision-maker respondents perceived the health of the Sussex coastal water body to be 'good' (56%). Results of both the Twitter poll and questionnaire indicate that the majority of stakeholders perceive pollution and commercial fishing to be the top two pressures of concern in Sussex’s coastal waters (43% and 29% of votes, respectively, in the Twitter poll; 66% and 49% of votes, respectively, in the questionnaire). The decision-makers perception of pressures slightly differed from that of the stakeholder respondents, with pollution and coastal development selected as the two key pressures of concern (each receiving 63% of the votes). The majority of decision-maker and stakeholder respondents perceived sections C and D of the coastline (between Worthing and Newhaven) to be the key location of pressures. Tackling pollution and managing fisheries were selected by the majority of stakeholder respondents as the priorities for action (each with 31% of the votes). In contrast, surveying habitats was identified by most decision-maker respondents as the priority for action (45%). Uses of Sussex’s coastal waters were grouped into 10 broad categories. Results indicated that angling, ‘multiple recreation activities’ and diving were the key uses within the area, in the order of the number of mentions. The entire area of the Sussex coastal water body was found to be important to a high percentage of stakeholder respondents (from 37% of respondents particularly valuing coastal section A to 54% of respondents selecting sections C and/or E). The majority of respondents valued the area for its wildlife value (ranging from 55% to 40% between coastal sections). Fishing interests were the next key value of the area cited (ranging from 27% to 33% between coastal sections). Survey results indicate that there is an appetite for involvement in Environment Agency WFD monitoring work, with 70% of decision-maker respondents indicating they were happy to contribute and 73% of stakeholders interested in collecting data. The primary type of data collection most decision-makers indicated their organisation could get involved in were species surveys and habitat descriptions (57% each). Stakeholders were most likely to want to be involved in species surveys (57%). Key support needed to facilitate stakeholder involvement includes funding a coordinator and providing equipment and training. Species observations, habitat data and sample collection were the main survey types conducted by decision-maker respondents (each selected by 30% of respondents). Table 3 (section 4.2.9) details the type of survey each organisation undertakes within the area of interest which can be consulted for ideas of partnership working. The key organisations recommended for environmental data collection by decision-makers are summarised in Table 5 (section 4.2.11). Most of the stakeholder respondents (55%) indicated that they did not conduct surveys in the area of interest. Of the stakeholders who indicated they do collect data, the majority (36%) conduct species observations. Table 6 (section 4.3.8) summarises the environmental data collected by stakeholder organisations in the area.